Present Tense in German and … The Danger Zone Regular Present Tense Verbs ► Regular verbs in German follow a pattern. 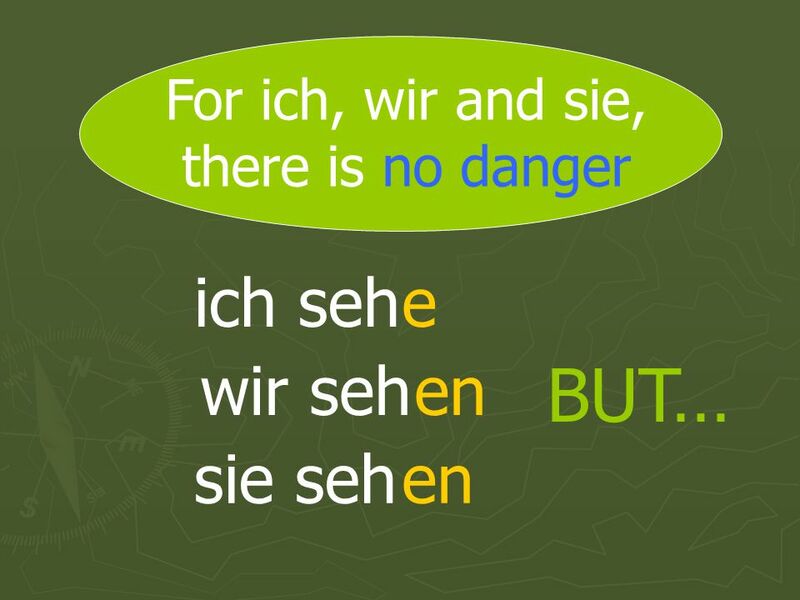 ► This makes regular verbs very. 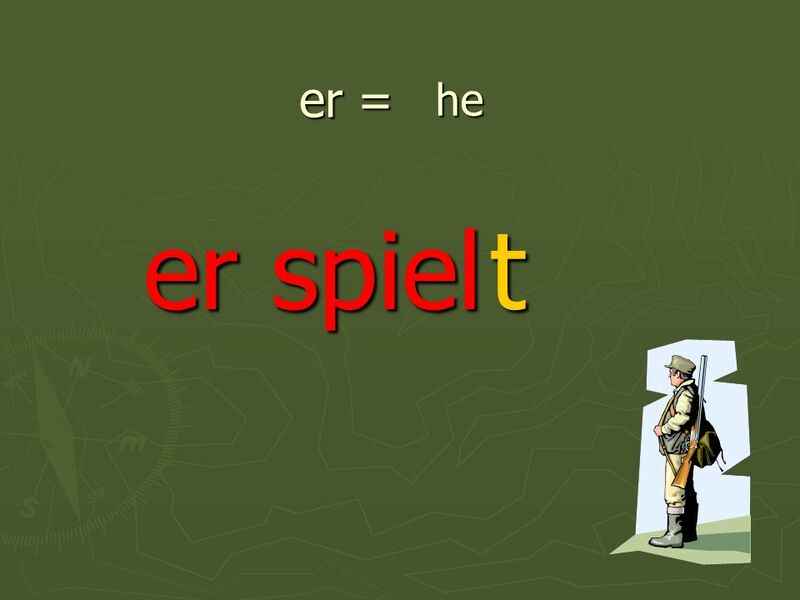 4 Regular Present Tense Verbs ► Regular verbs in German follow a pattern. 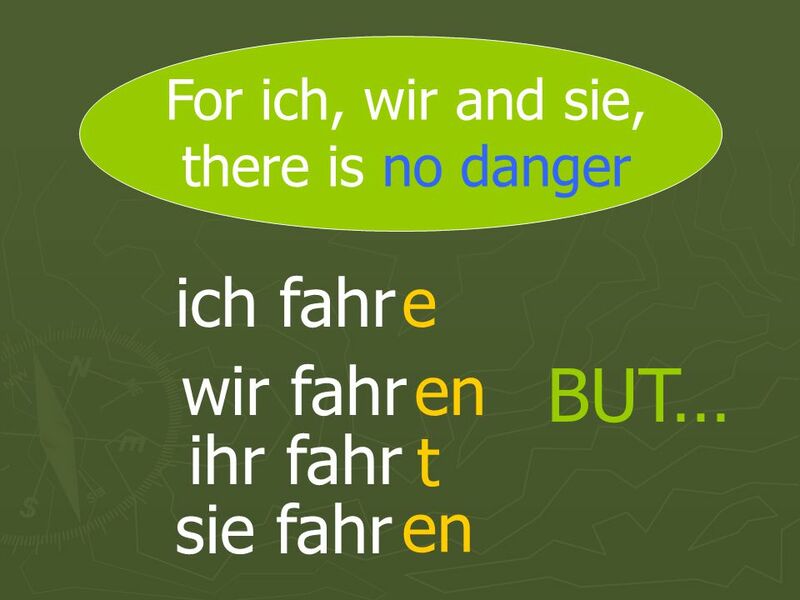 ► This makes regular verbs very easy to use. 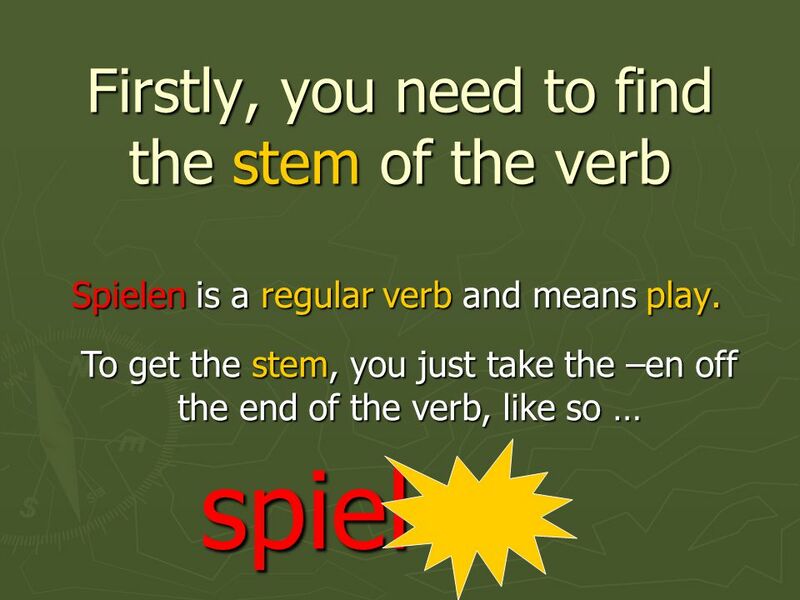 ► You just need to learn which ending the verb should have with which pronoun. 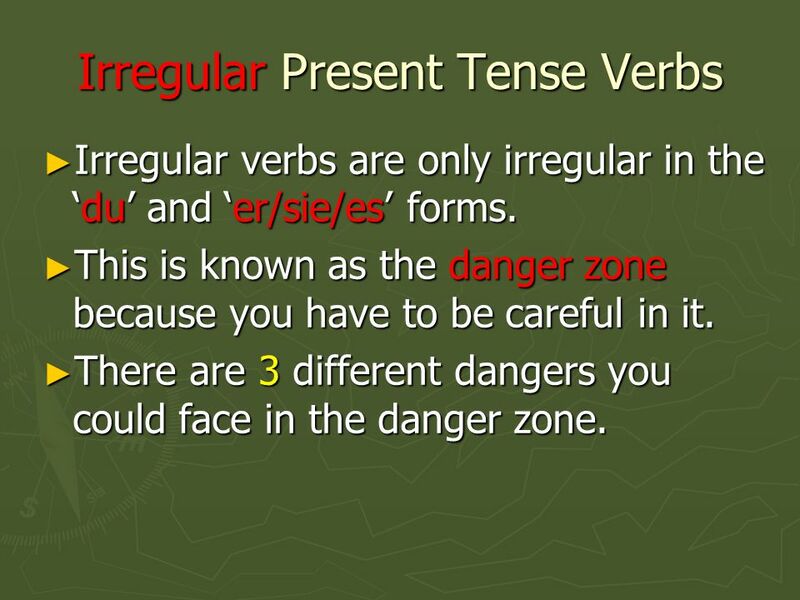 14 Irregular Present Tense Verbs ► Irregular verbs are only irregular in the ‘du’ and ‘er/sie/es’ forms. 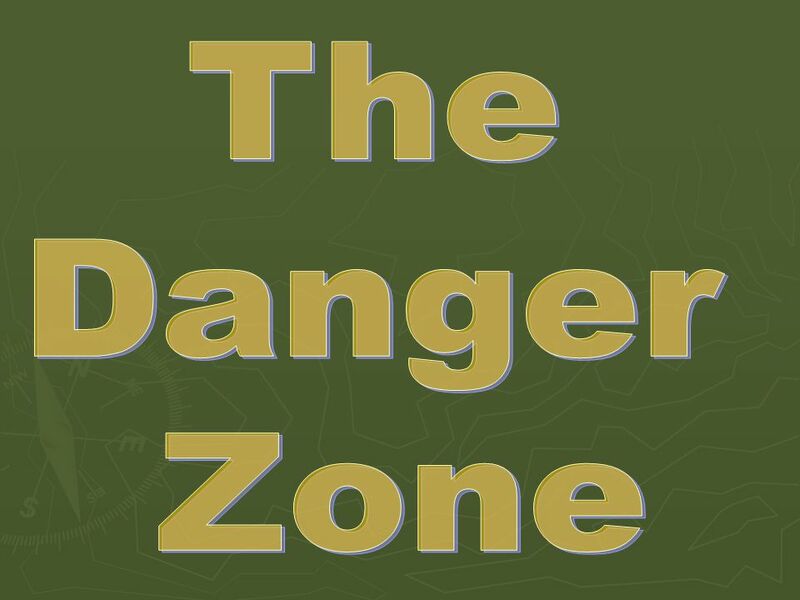 ► This is known as the danger zone because you have to be careful in it. 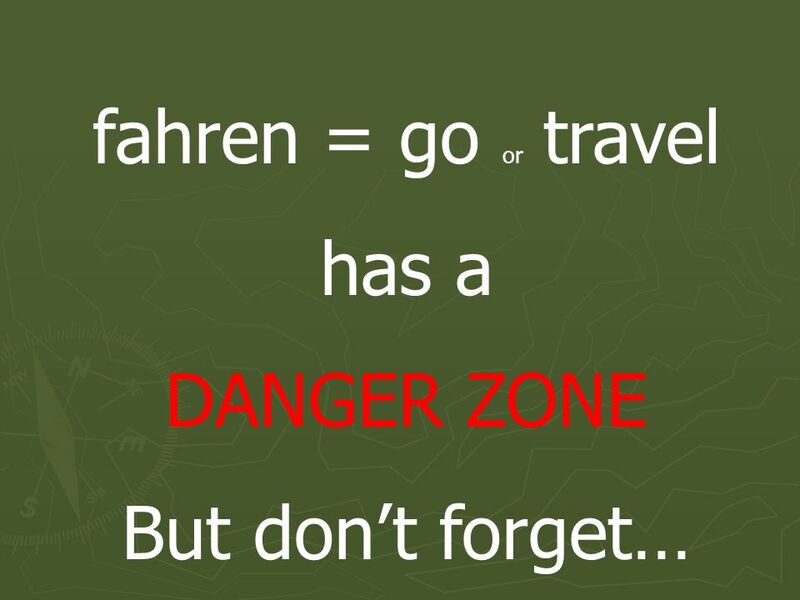 ► There are 3 different dangers you could face in the danger zone. 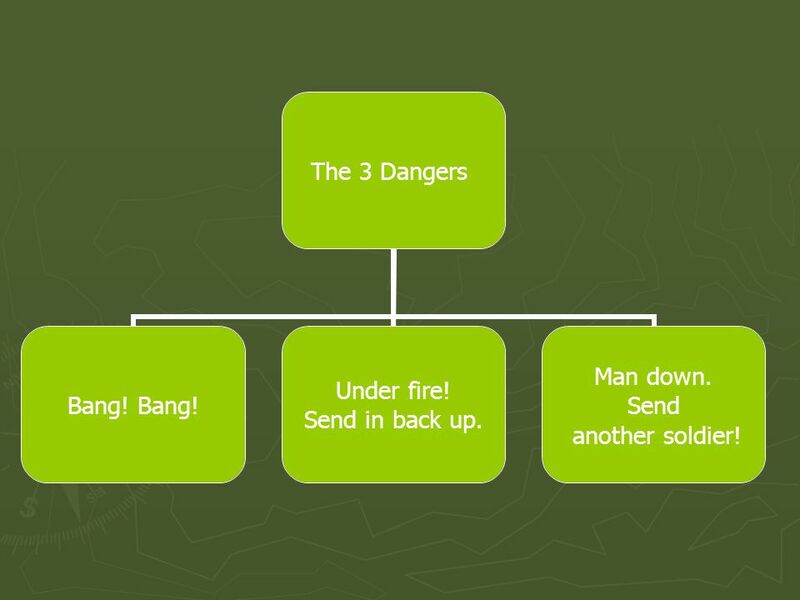 15 The 3 Dangers Bang! Under fire! Send in back up. Man down. Send another soldier! 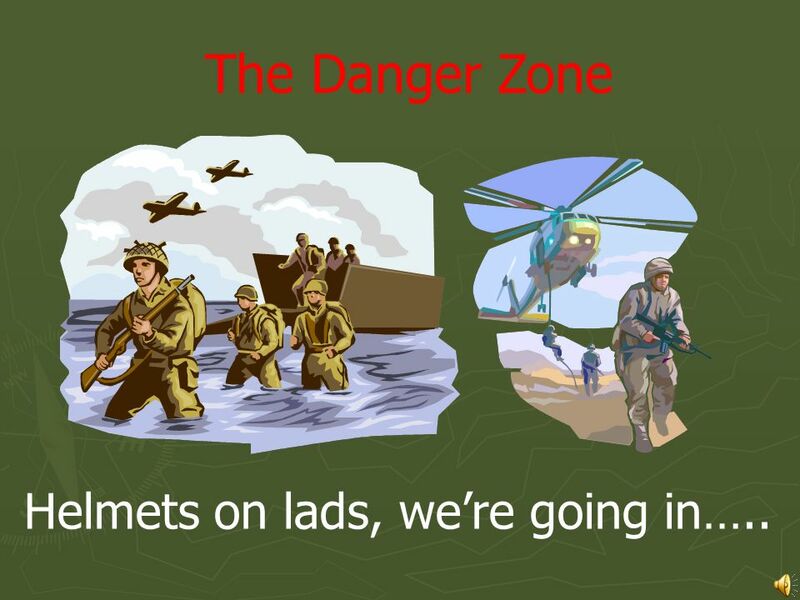 16 The Danger Zone Helmets on lads, we’re going in…..
20 The Danger Zone…. 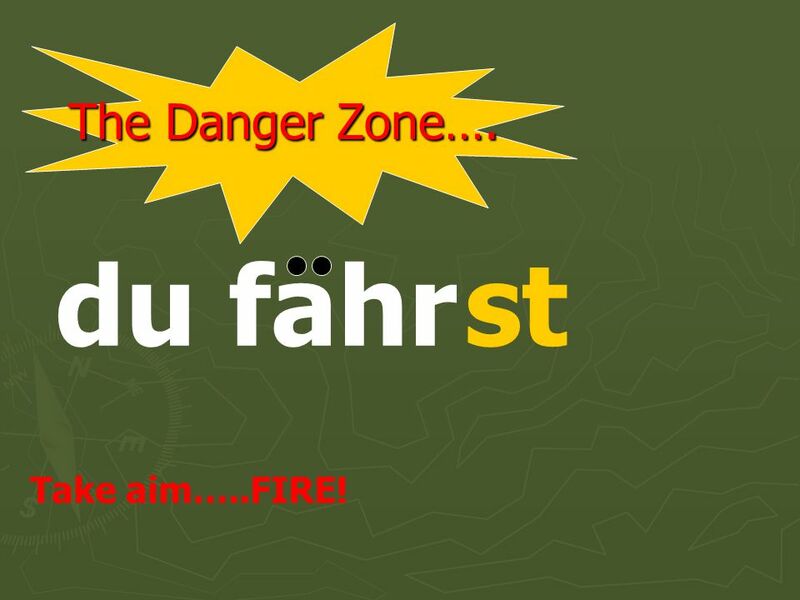 du fahrst Take aim…..FIRE! 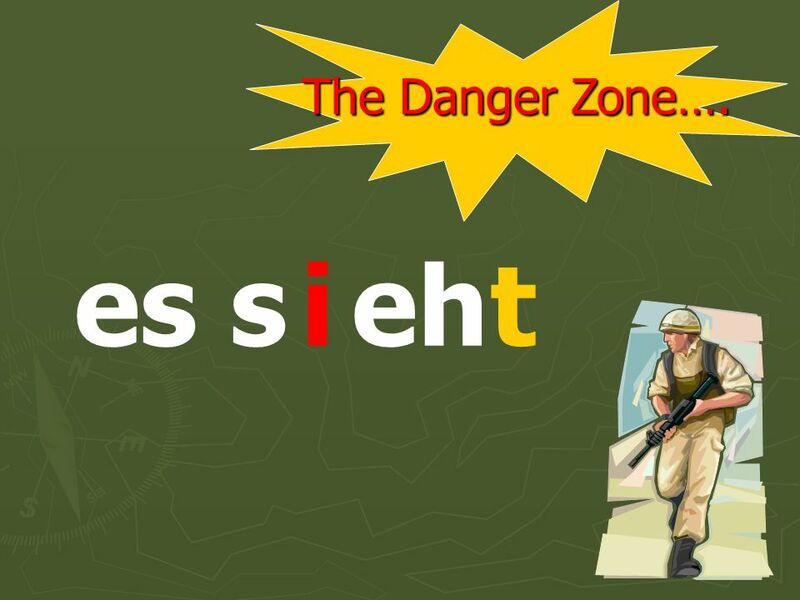 21 The Danger Zone…. 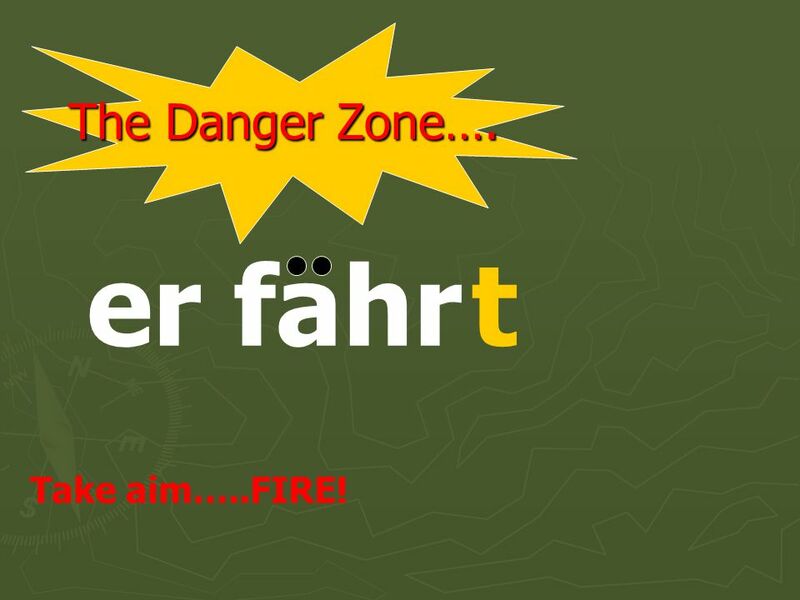 er fahrt Take aim…..FIRE! 22 The Danger Zone…. sie fahrt Take aim…..FIRE! 23 The Danger Zone…. es fahrt Take aim…..FIRE! 34 Under fire! 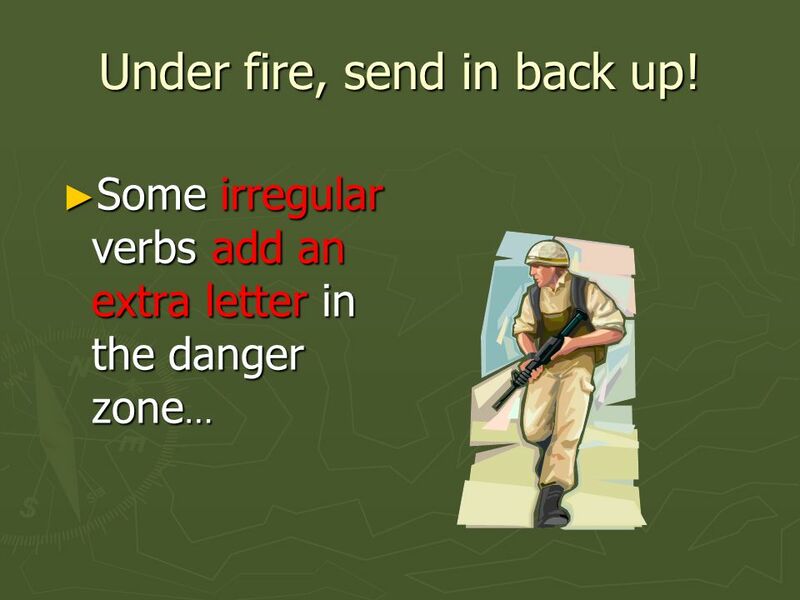 Send in back up! 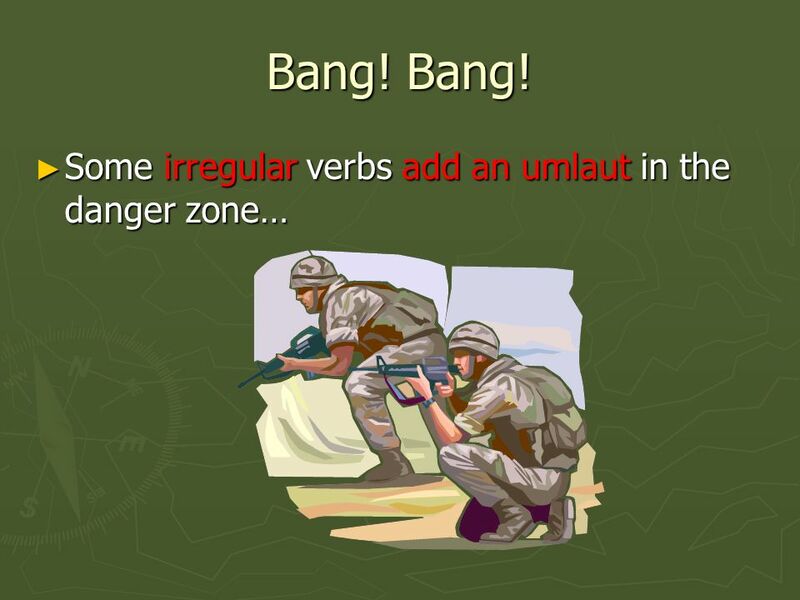 - Try changing some verbs yourself - Add an ‘i’ in the danger zone only 1. I read Harry Potter (lesen) 2. He reads Artemis Fowl. 3. She sees the old grandmother 4. You see the church. 5. We see the school. 6. You read Lord of the Rings. Ich lese Harry Potter. Er liest Artemis Fowl. Sie sieht die alte Oma. Du siehst die Kirche. Wir sehen die Schule. 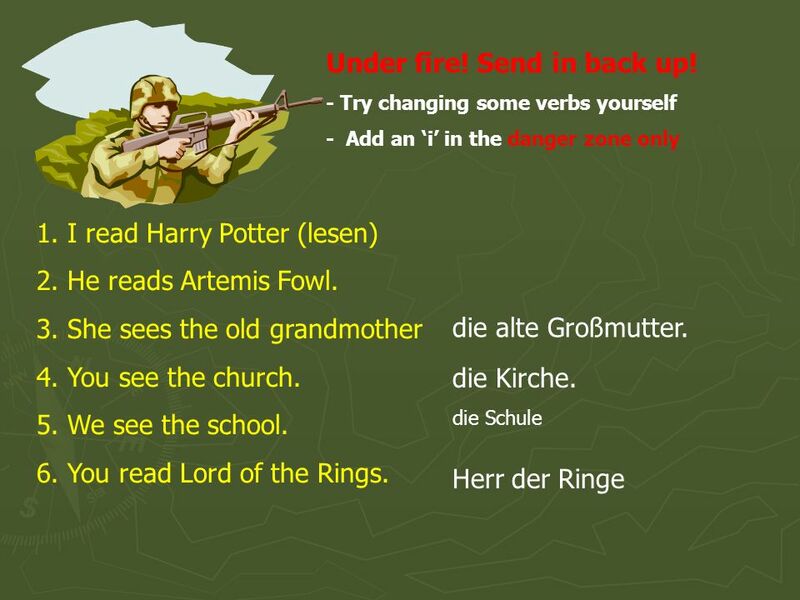 Du liest Lord of the Rings. 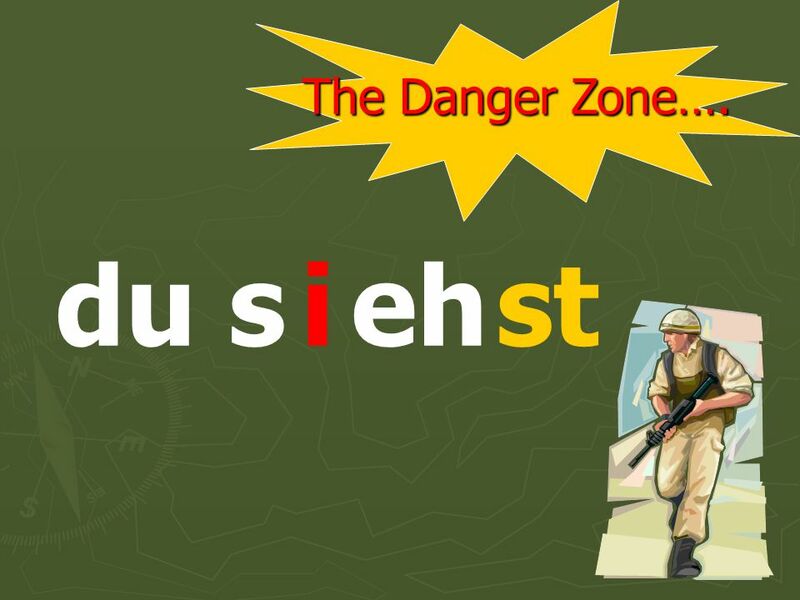 38 The Danger Zone…. du tr ffstie Man down! 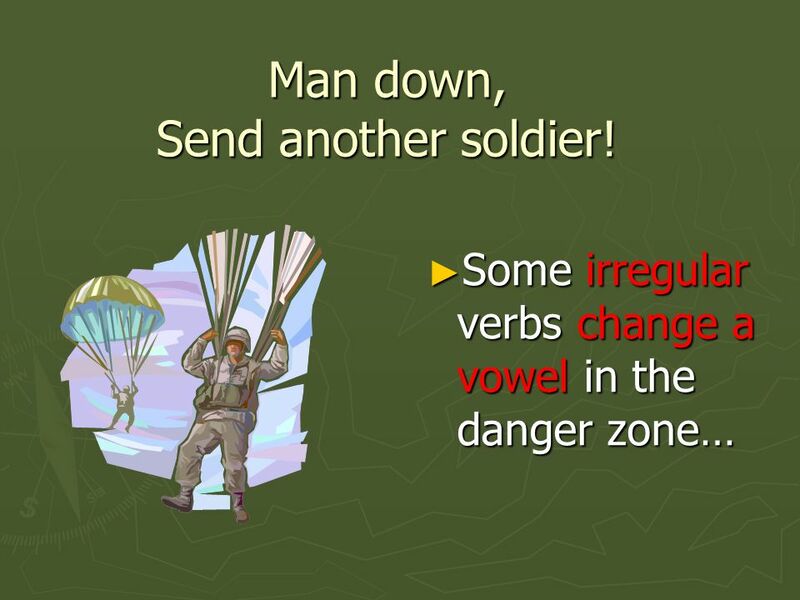 Send another soldier. 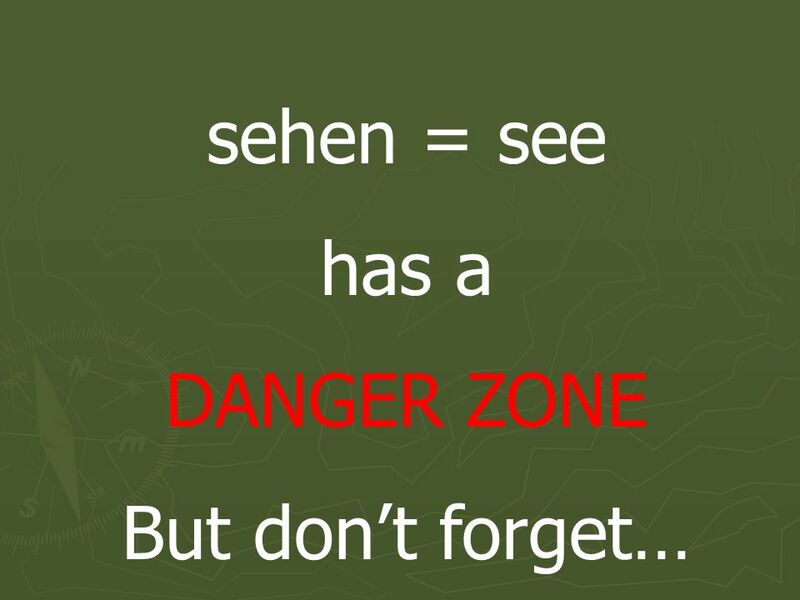 39 The Danger Zone…. er tr fftie Man down! Send another soldier. 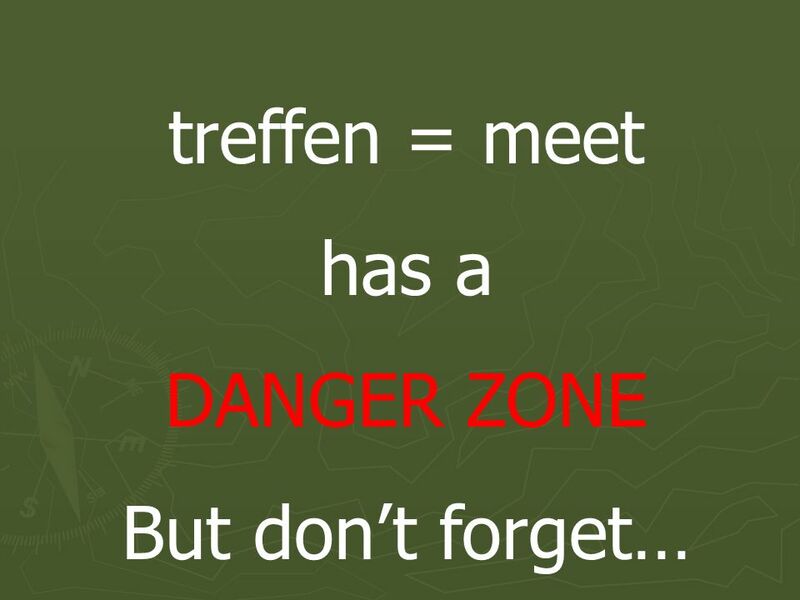 40 The Danger Zone…. sie tr fftie Man down! Send another soldier. 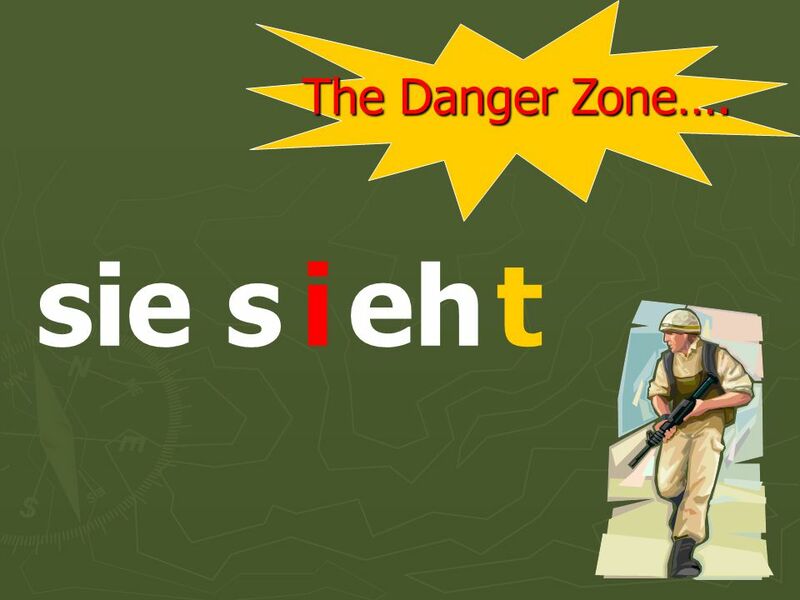 41 The Danger Zone…. 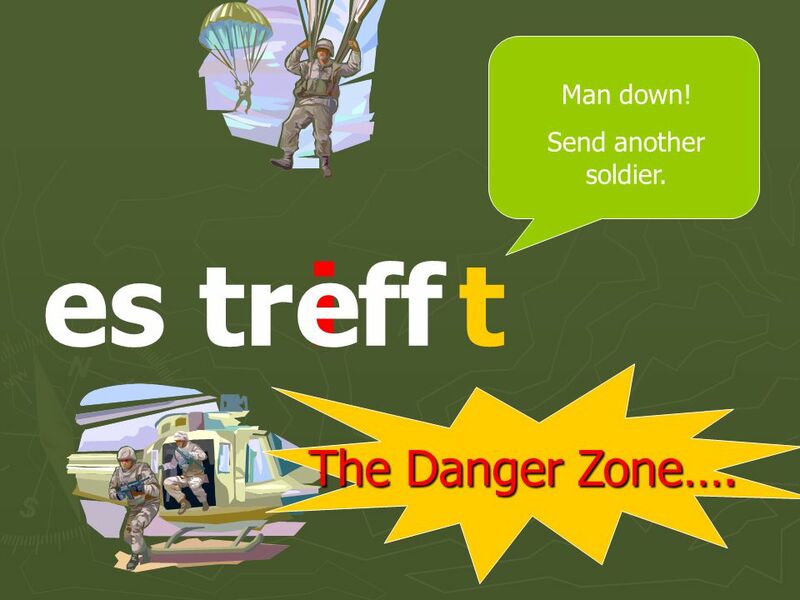 es tr fftie Man down! Send another soldier. 42 Man down! Send another soldier! - Try changing some verbs yourself - Change the vowel in the danger zone only 1.He eats an apple (essen) 2.She speaks German (sprechen) 3. 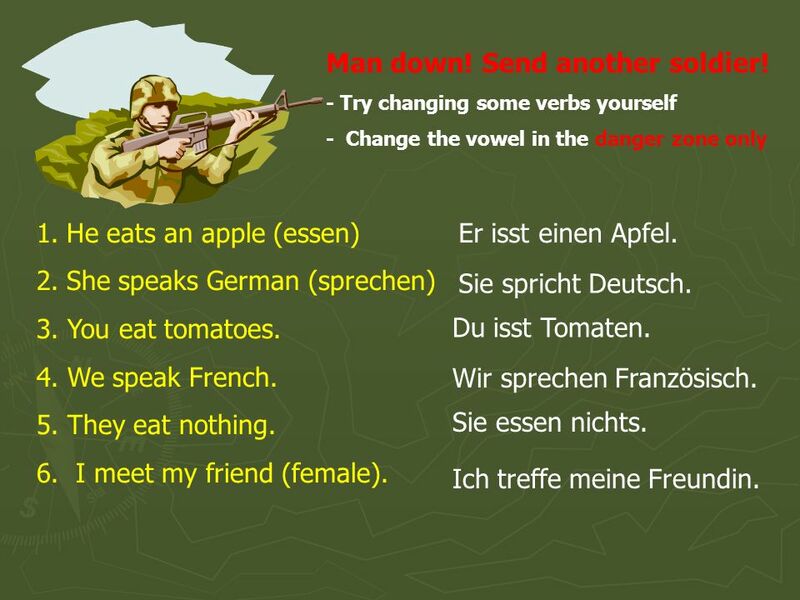 You eat tomatoes. 4. We speak French. 5. They eat nothing. 6. I meet my friend (female). einen Apfel. Tomaten. Französisch. 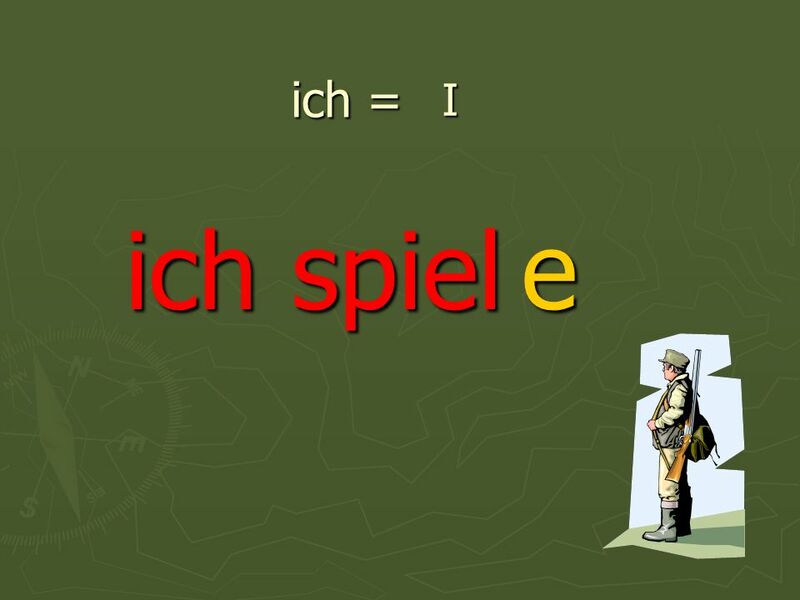 nichts. meine Freundin. 43 Man down! Send another soldier! 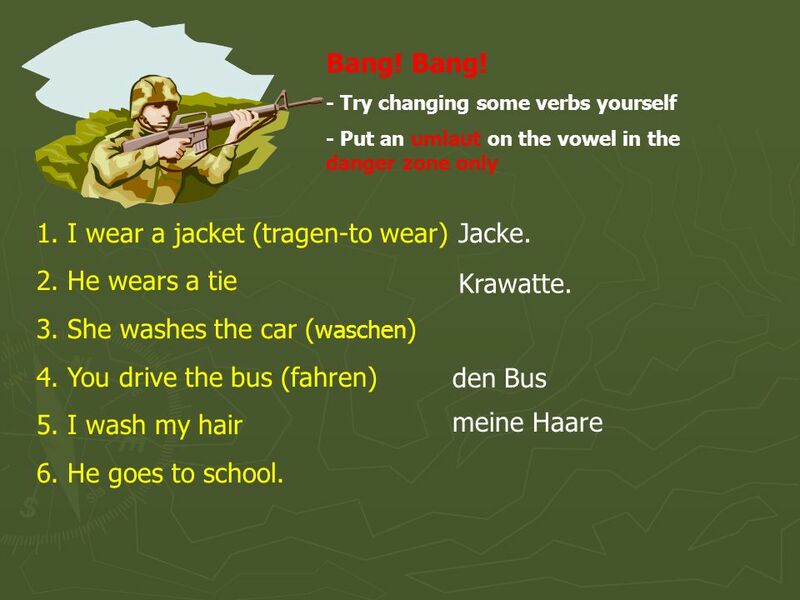 - Try changing some verbs yourself - Change the vowel in the danger zone only 1.He eats an apple (essen) 2.She speaks German (sprechen) 3. 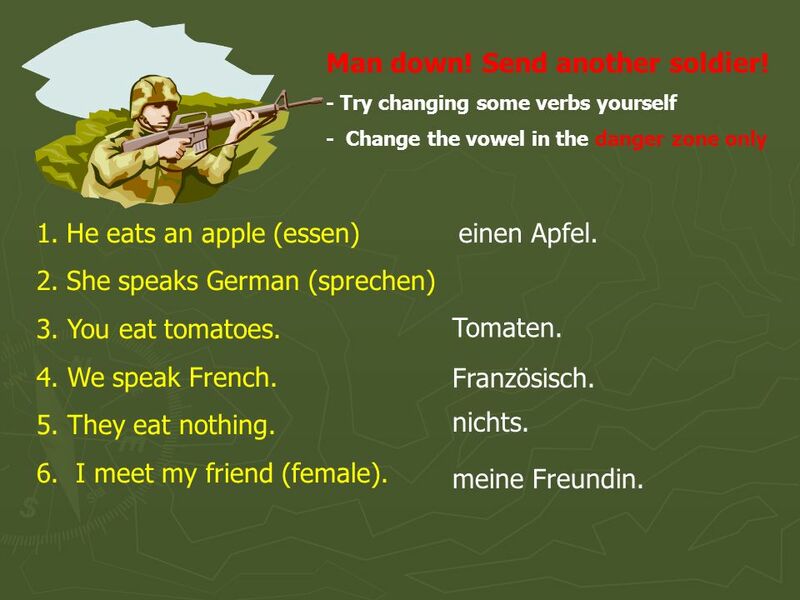 You eat tomatoes. 4. We speak French. 5. They eat nothing. 6. I meet my friend (female). Er isst einen Apfel. Sie spricht Deutsch. Du isst Tomaten. 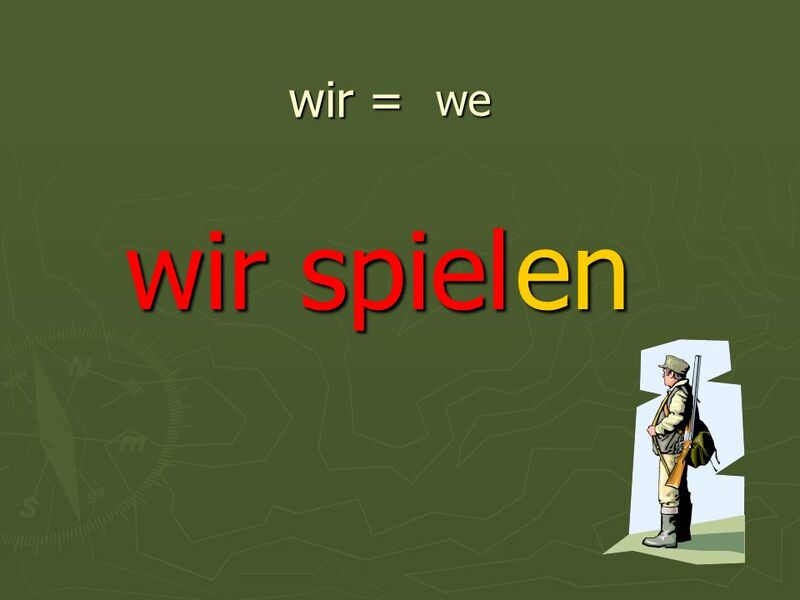 Wir sprechen Französisch. Sie essen nichts. Ich treffe meine Freundin. 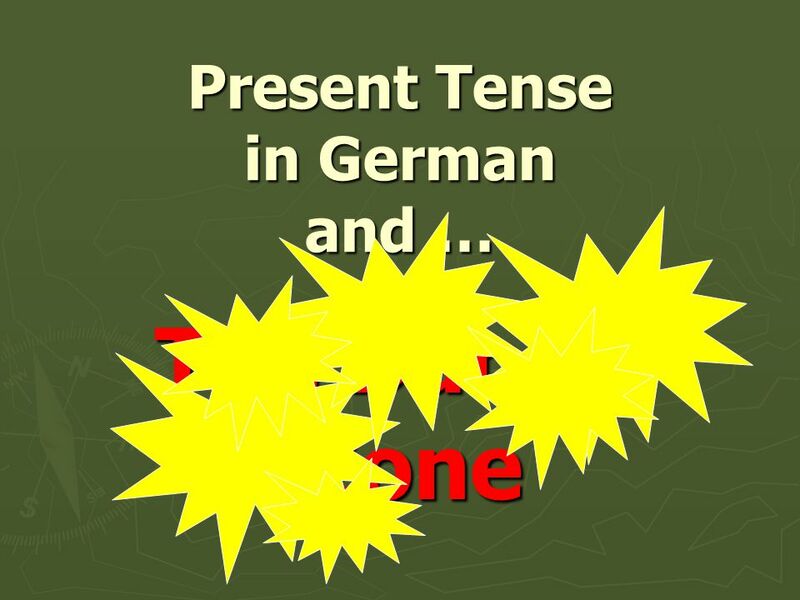 Herunterladen ppt "Present Tense in German and … The Danger Zone Regular Present Tense Verbs ► Regular verbs in German follow a pattern. 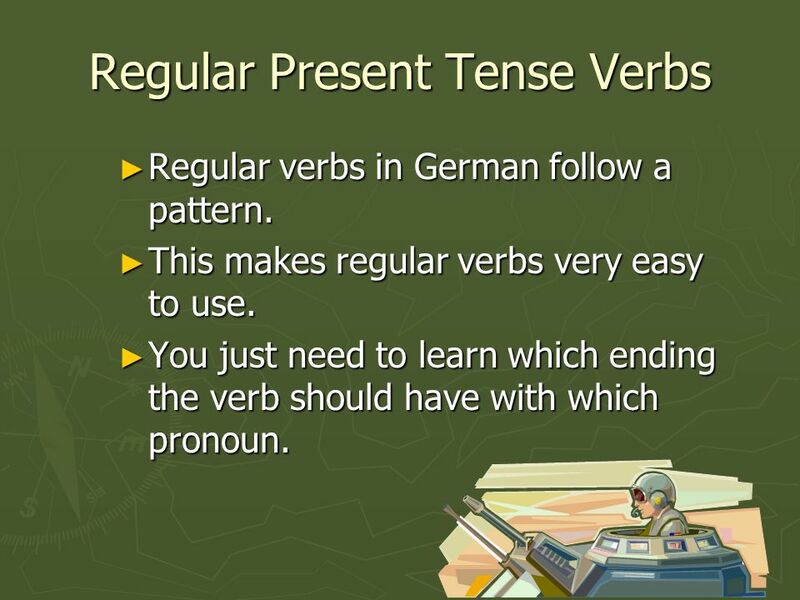 ► This makes regular verbs very." Verb Conjugation In German you need to be able to conjugate a verb in the present tense. It is important not only to use correct speech but depending.